4 The Israelites again did what was evil in the sight of the Lord, after Ehud died. 2 So the Lord sold them into the hand of King Jabin of Canaan, who reigned in Hazor; the commander of his army was Sisera, who lived in Harosheth-ha-goiim. 3 Then the Israelites cried out to the Lord for help; for he had nine hundred chariots of iron, and had oppressed the Israelites cruelly twenty years. Judge Deborah is not Judge Judy. She’s not a reality TV star. Judge Deborah is a prophet of God. She was counted among those who rose to leadership in Israel during the period between the death of Joshua and the rise of the monarchy. When Joshua died, he didn’t leave a designated heir. There was no Joshua to Moses, no specific leader to whom the tribes of Israel looked to for leadership. While we might be led to believe that the conquest of Canaan was completed under Joshua’s leadership, this wasn’t completely true. Israel lived in pockets in the land, but they shared it, and this was not always to Israel’s benefit. Thus, conflict was continuous. When the people cried out for relief, leaders would arise from within the community to lead the people to victory. According to the Book of Judges, Israel’s big problem was that it continually “did evil in the sight of the Lord,” and therefore suffered divine rejection (at least for a time). When Israel would return to Yahweh, Yahweh would take steps to restore Israel by calling forth a savior figure. It might be a military leader like Gideon or Samson, but at least on one occasion it was a woman prophet. As we attend to this story, it is appropriate that we read it in light of the overarching message of God's commitment to God's covenant with Abraham and Sarah and their descendants.God might discipline the people of Israel, so as to keep them on the path forward, but God will not abandon them. Deborah was respected as a prophet by her people, the first prophetess since Miriam, the sister of Moses. John Goldingay notes that the name Deborah means Bee in Hebrew. The name of her husband is “Torches.” Goldingay points out that the name itself is rather odd, and her husband doesn’t figure at all in the story. 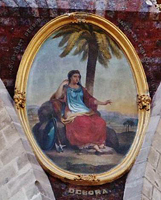 This leads him to suggest that the message here is that Deborah is a “fiery woman.” Deborah is a woman of power, respected by the people who came to seek out her guidance, as she sat under a palm tree near her home in the hill country of Ephraim. She lived in the middle of nowhere, and yet people streamed to gain her wisdom. We are used to men standing at the center of the biblical story. They are the leaders both political and religious. This is, after all, a patriarchal society. Yet, as Goldingay points out: “Whereas institutional ministry in the Old Testament (notably that of the priests) belongs to men, when God wants to break into the regular institutional arrangement, prophecy is one way God does so, and women are sometimes the people God then speaks through.” [Joshua, Judges & Ruth for Everyone, p. 100-101]. When I read of a person like Deborah, who shatters norms because of her gender, I can’t help but think of a person like Aimee Semple McPherson. 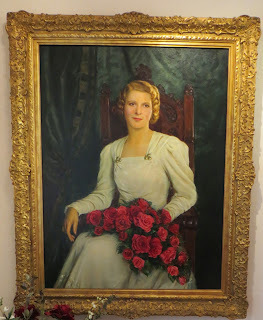 I might not share her politics or her theology, but in an age when women were largely kept in the kitchen or the children’s Sunday School rooms in mainline Protestant churches, she was standing tall as a preacher, church planter, founder of a denomination, an early adopter of radio, and more. Barak, from Kedesh in Naphtali, to gather an army from among the tribes of Naphtali and Zebulun to respond to this threat on the part of the Canaanites. God tells Barak through Deborah to gather the troops on Mount Tabor, and then God will deliver Sisera and his army into Barak’s hands. Victory is assured, because God is with them. The lectionary reading ends. We don’t get to read further about the battle and the death of Sisera at the hands of another woman. We don’t read that Barak doesn’t want to go into battle without Deborah at his side, and that she agrees to go but that the glory will not go to him, but to a woman, the woman named Jael who will kill Sisera. Yes, it’s bloody, and therefore not the kind of text we often read in church. It’s best to leave things like battle unspoken. We can read further if we wish. We remember Deborah today in large part because she stands out among her peers. In a patriarchal age, when women were not generally allowed out in public, figures like Deborah and Miriam are important witnesses to God’s wisdom. They are exemplars for women, who find in their stories permission to break through the institutional limitations and express their gifts and calling. The stories of here of Deborah and Jael in Judges 4—despite the violence that is present in the story—invite us to move beyond stereotypical roles for women. Susan Bond writes that in this passage “God is not sexist about fully invested female leadership. God is no ‘respecter of persons.’” Then she writes that “in a time when the church still struggles with women in leadership roles, a sermon about Deborah could be crafted to promote the divine mandate for equality without regard to gender and without reducing women to their sexuality or reproductive states” [Preaching God’s Transforming Justice, p. 487]. The story of Deborah is a call for the church to break out of stereotype, and to recognize the gifts of all members of the community. I know that my denomination heard that message loud and clear in 2005, when the Rev. Dr. Sharon Watkins was elected as General Minister and President of the Christian Church (Disciples of Christ), the first woman to lead a mainline Protestant denomination. Of course, it took eighty-five years for a mainline church to follow in the footsteps of a Pentecostal evangelist, who heard the call and would not be deterred. Such was the case of Deborah, who heard the call and did not her culturally-defined status hinder her work in the service of God. Yes, Judge Deborah was not Judge Judy. She was not a Reality TV star. She was a powerful woman, who led Israel in a moment of crisis, and beyond. Let us give thanks to God for women like Deborah and Miriam and Aimee Semple McPherson and Sharon Watkins. Picture attribution: Unidentified. Deborah with weapons and palm tree, from Art in the Christian Tradition, a project of the Vanderbilt Divinity Library, Nashville, TN. http://diglib.library.vanderbilt.edu/act-imagelink.pl?RC=56001 [retrieved November 14, 2017]. Original source: http://commons.wikimedia.org/wiki/File:Cathedral_Basilica_of_Saint_Clement,_Tenancingo,_Mexico_State,_Mexico04.jpg.